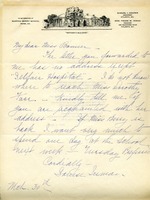 Louise Inman writes to Miss Bonner asking her for the address of Miss Dorothy Farr because the letter Miss Bonner forwarded to her has only the address "Selfair Hospital." Louise Inman also writes that if Miss Berry is back she'd like to spend Tuesday of the next week with her. 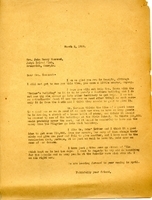 Farr requests more information about the Mothers Building and offers a dining room table in response to the request for furniture for the building. 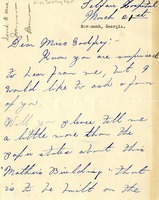 Martha writes to Miss Farr about her letter that Miss Godfrey sent in about the furniture. While it could not be used for the Mothers building the school could gladly use it at another building on campus if Miss Farr feels she could give it. 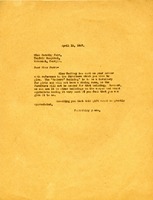 In this letter Tarleton Collier asks Bessie Bonner to help in the Mother's building campaign as well as a copy of the picture of the typical Berry girl from her office. 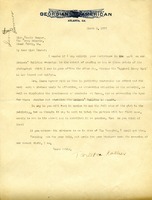 Martha Berry asks Mrs. Hammond not to get involved with the "Mother's Building" -- she is no longer enthusiastic about the project and does not think Mrs. Inman needs to seek support outside the south. Berry hopes that the Pilgrims will donate money for a guesthouse.